At CatCouture, we breed for health, elegance and most importantly, love. Cats are selected into our breeding program based on parental health, breed standards and personality. Much preparation is required before the arrival of new kittens. A licensed veterinarian and a certified cardiologist scan our cats prior to breeding, ensuring no pathologies are present. Also, cats are shown within various associations to ensure we are breeding not only healthy cats but also top quality cats. 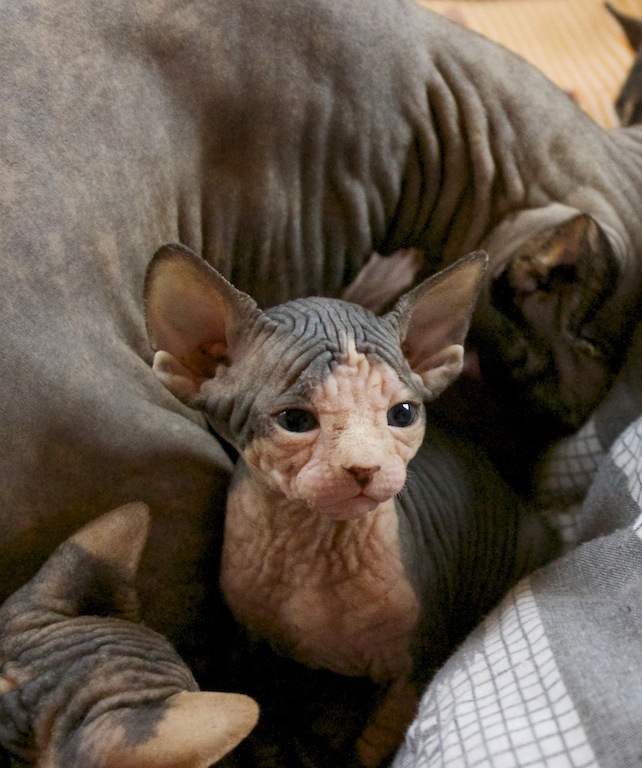 Kittens are not just produced for being adopted as pets; they are produced to be top quality show cats that are continuing on the legacy of the great Canadian Sphynx. Please take a moment to review our Frequently Asked Questions (FAQ), The Reputable Breeder and Reserve a Kitten sections. If any other questions should come up that are not addressed in the FAQ, please contact me for clarification. Our cats live on site with us and have free rein of our home. Please feel free to schedule a meet and greet with our cats. Sphynx cats have always been referred to as a cross between a dog and a monkey due to their inquisitive and eccentric personalities. Why a dog/monkey mixture? They will play fetch like a dog, use their dexterous paws like chimps, hang out on your shoulders like spider monkeys, kiss you with puppy kisses, investigate all aspects of your dwellings like squirrel monkeys, need companionship and be very playful like their canine counterparts. Be prepared for a world of love, companionship and laughs. What are your cats/kittens exposed to and raised with? Are they well socialized? My cats are exposed to all age groups, such as: infants, toddlers, teenagers, adults and seniors. My cats live with a 6 year old black Labrador retriever and one exotic shorthair cat. 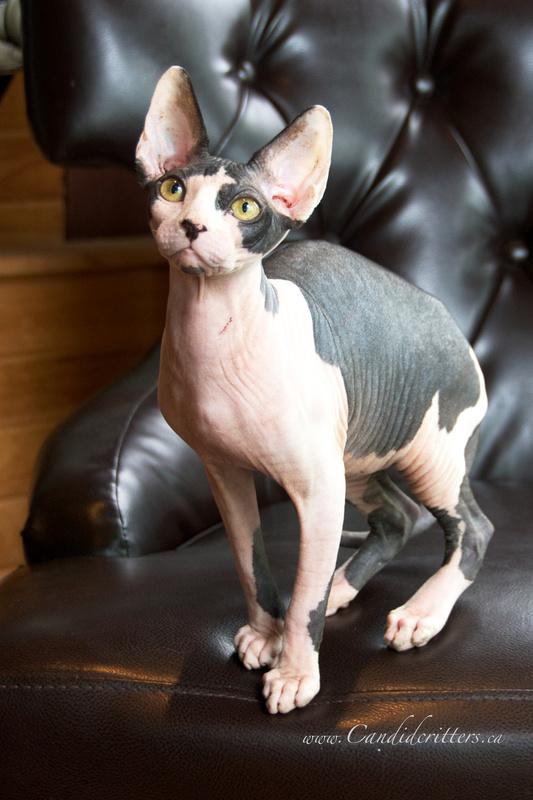 Are Sphynx cats free of grooming responsibilities? No. 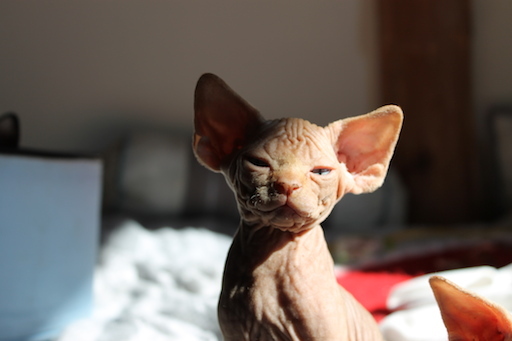 Sphynx cats need a grooming routine like other cats. They require aid in keeping their skin, ears, eyes and claws clean. These responsibilities become second nature after a couple of times and will require only 20-30 minutes of your time every 10-14 days. 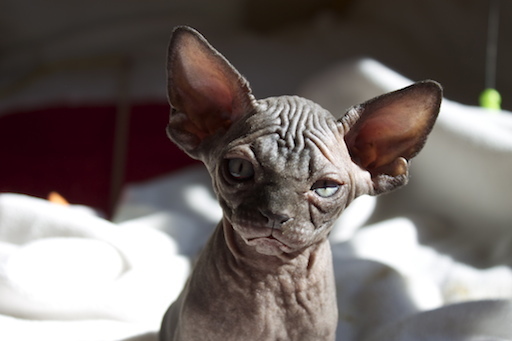 Visit the Care section to review the bathing instructions for Sphynx cats. How often do I bathe them? 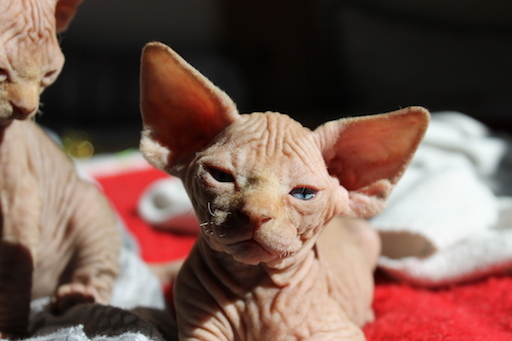 Sphynx kittens should be bathed once every 10 days whereas adults vary from 10 – 14 days. Since they bathe more frequently than a furry feline does this mean they are not afraid of water? Not necessarily. The breakdown of my group is 50% who will put up with a bath, 25% who don't care and the other 25% hate bath time. Albeit, the 25% that hate baths will always sit on the ledge of the tub and watch me have a bath and bathe me. 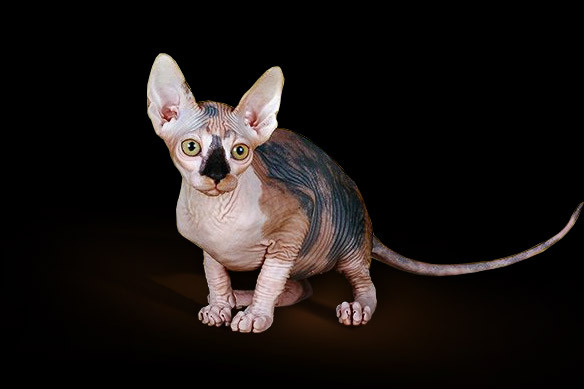 Unfortunately, Sphynx cats are not hypoallergenic and people who are allergic to cats will have similar allergic reactions to a Sphynx cat as they would to a furry cat. 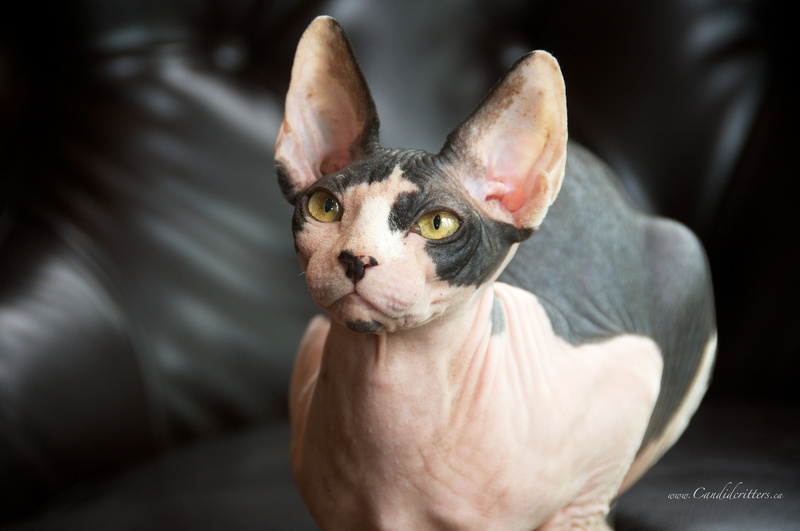 Some individuals find their allergies are not as aggravated by Sphynx cats, however it differs from person to person and there are no guarantees. Allergic reactions are caused by proteins in feline salvia, which are deposited onto their skin/fur by natural tendencies to bathe themselves. 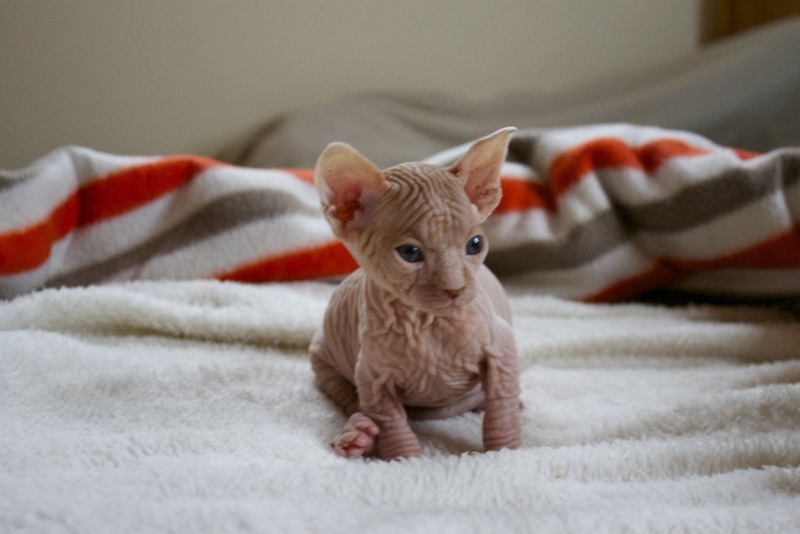 Sphynx cats are not completely hairless; they have “peach fuzz” all over their body. 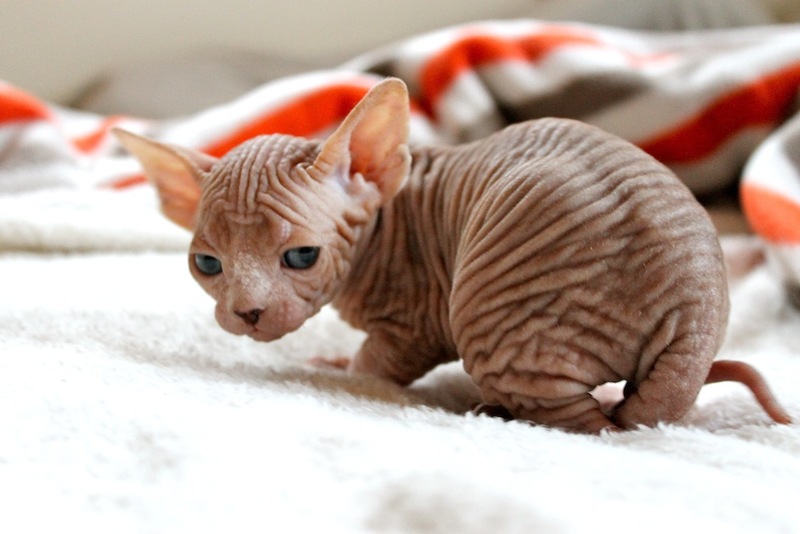 Some Sphynx cats can develop furry patches on parts of their body over time. 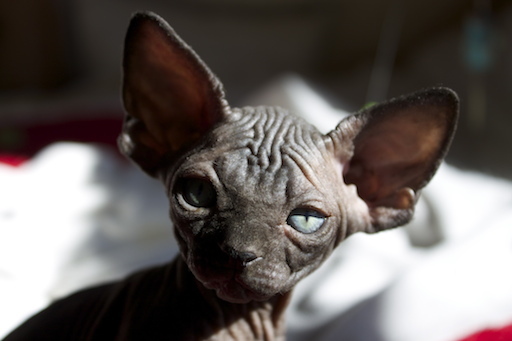 What do you feed your Sphynx cats? Currently, my cats receive a mixture of Royal Canin Oral Sensitive combined with Orijen Cat Food, raw meat (chicken and beef) and added supplements (L-Lysine, Purina Forti Flora, Omega 3 Supplements, TC Instincts supplements). Orijen Cat Food is a Canadian based food company that has 80% protein in their food that is supplied by local markets within Canada. What is your level of experience working with animals? My career in this industry started at the ripe age of 15 and has not ceased to excite me and keep me enthused to the present day. I have been in the animal industry for almost two decades and have held various positions and taken many post-secondary education courses specific to animals. These positions involved paid, volunteer and research work. Some of my positions were kennel attendant, veterinary assistant, kitten nursery feeder and veterinary receptionist. The specific courses that I have taken are: zoology, ecology, animal physiology, and advanced biochemistry with specific interest in pathologies of biochemical pathways. My research has been in animal histology with specific interest in staining techniques of Danio rerio (zebra fish) under the direction of Dr. B. Crawford, University of New Brunswick. In 2011, I took part in research for preparing an animal/plant catalogue of Barbuda to further education on the diversity of the island. What is CatCouture’s social responsibility to the animal community? Our social responsibility is geared toward ensuring all cats are treated in a respectable manner and are given equal opportunities like the purebred cat community. Groups we work with through donation and volunteer work are the Chickadee Cat Club (Fredericton, NB), Ca-r-ma (Maritime provinces) and the Toronto Humane Society (Toronto, ON). These groups ensure the well being of all cats on this grand planet. They provide food, shelter, medical treatment, capture release programs, discounted spay/neuter clinics and awareness of animal issues within the community (not only related to cats). Do you use environmentally friendly products within your cattery? Yes, CatCouture uses many environmentally friendly products within our cattery. We want to reduce our carbon footprint on the planet and we strive to work with many naturally derived products. How we reduce our carbon footprint on the planet is by using compostable bags, recycling packaging, using compostable cat litter and most importantly, purchasing from local farmers. We disinfect our cattery using products by Green Works, which contain naturally derived cleaning materials, i.e. citric acid, sodium bicarbonate, hydrogen peroxide, etc. Although we use green friendly products, we still adhere to the importance of sterilization and frequent hand washing. Kittens are only placed into homes that are best suited for them. Your family (spouse/children/pets -- ages and breeds)? Your daily routine (how long are you away from home)? Your housing situation (apartment, condo, house)? What made you interested in this breed? What do you wish for or expect from me as a breeder? What qualities are you looking for in your future kitten – playful, calm, independent/dependent? Remember, there are no right or wrong answers; this gives me an idea of who you are and what kitten/cat would be best suited for you and your family. What is the price of a kitten? What does CatCouture’s contract cover/provide for me as a future kitten parent? What does a "Health Guarantee" mean? Should something happen to your kitten within three years and it is deemed to be of genetic fault (e.g., hypertrophic cardiomyopathy, kidney disease, cancer, etc. ), CatCouture will replace your kitten with another of equal value or refund you the price of your kitten minus the initial costs of spaying/neutering and vaccinations (official letterhead receipts provided for proof of veterinary costs). Hypertrophic cardiomyopathy (HCM) is a thickening of the left ventricle of the feline heart and has been documented within the Sphynx breed. Unfortunately, HCM can lead to heart failure and ultimately, death. What are CatCouture’s screening methods for preventing hypertrophic cardiomyopathy? CatCouture’s preventive measure is seeing board certified cardiologists at the Atlantic Veterinary College (AVC) once per year. All breeding cats are scanned yearly to ensure they are healthy and have no pathologies developing. Copies are provided of parents’ clear HCM reports in the kitten package provided. What screening methods are performed at CatCouture? 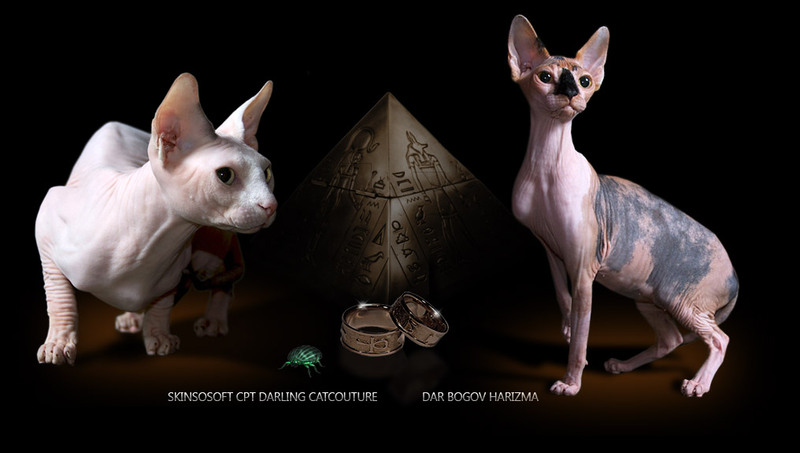 CatCouture performs DNA testing through the University of California (UC Davis) to ensure there are no kidney pathologies within CatCouture cats before entering into the breeding program. Also, blood typing is performed to ensure no kittens are subject to Fading Kitten Syndrome. Who are CatCouture’s board certified cardiologists? 1. The Reputable Breeder places cats/kittens by contract. 2. The Reputable Breeder places cats/kittens with a health guarantee. 3. The Reputable Breeder insists and contracts the return of a cat/kitten should the purchaser be unable to keep the cat/kitten. 4. The Reputable Breeder carefully interviews prospective owners and has specific requirements to be met, i.e. cat/kitten is to be altered (if the breeder is not already practicing early altering), not allowed to roam outdoors etc. 5. The Reputable Breeder is willing and able to educate the novice. They happily answers questions regarding the breed and their breeding program. 6. The Reputable Breeder insists on being informed of health, genetic, and/or behavioral problems the cat/kitten may develop. 7. The Reputable Breeder does not have more cats/kittens then they are able to care for i.e., clean, healthy and socialized. 8. The Reputable Breeder spends individual time with each of their cats/kittens. 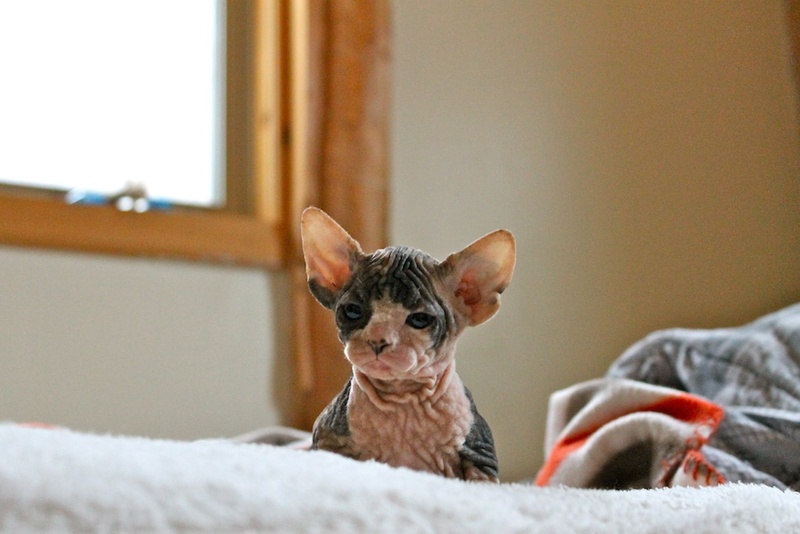 9.The Reputable Breeder is concerned with temperament as well as the health of their cats/kittens. 10. The Reputable Breeder makes themselves available to provide advice and aid throughout the life of the cats/kittens they have placed. 11. The Reputable Breeder will allow access to their cattery. If a breeder does not want you to see their cattery, there may be trouble at that cattery. 12. The Reputable Breeder NEVER sells a sick cat/kitten. If a breeder lets a sick cat/kitten go - they clearly do not have the feline’s best interest at heart. 13. The Reputable Breeder requires you to take your cat/kitten to a licensed veterinarian within 48-72 hours of bringing the cat/kitten into your home. 14. The Reputable Breeder has only a few litters a year and there are usually waiting lists or many interested in adopting kittens. This cat/kitten will be with you and your family for many years to come. Waiting 3 - 6 months for the cat/kitten of your dreams is well worth the wait. 15. The Reputable Breeder will keep their cats up to date on vaccinations, general medical check-ups, FeL/FIV testing, and HCM testing. Ask the breeder what they test for and ask to see copies of the paperwork, if a breeder gets offended that you ask, move onto a new breeder. The breeder may wish to not give you a copy for confidentiality reasons; however, they should be open to allowing you to view them. 16. The Reputable Breeder will have a limited number of litters on site due to providing adequate socialization of kittens. When there are more than two litters it becomes hard for a breeder to give each kitten the right about of attention they need. 17. The Reputable Breeder will only ask for a deposit that is 1/3 the cost of the cat/kitten. Deposits are used to demonstrate there is a real interest in the cat/kitten. By putting a deposit down it means the breeder will turn away other potential adopters. It is also used to cover the cost of spaying/neutering your cat/kitten. Deposits that are higher than this may be questionable. 18. 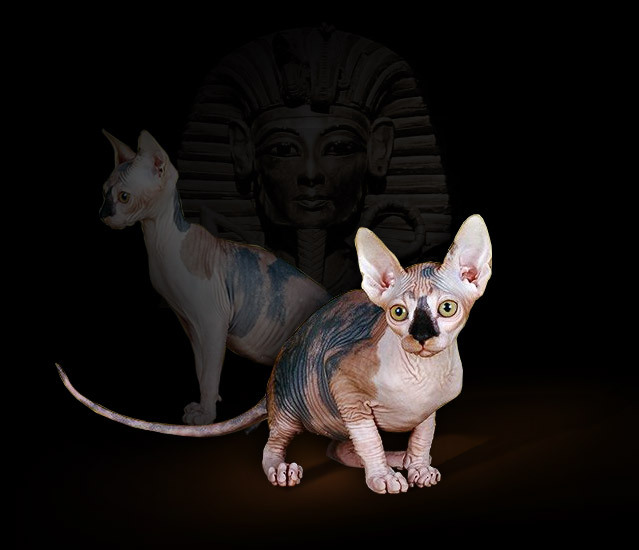 Lastly, Sphynx pet kittens cost $1500 and breeders are $2000-$3000. This is the fair price for a Sphynx. You usually get what you pay for - if the cost is much less and there is no reason listed, I would be very skeptical that the cat is from a reputable breeder or going to be healthy. The breeder may be skimping on care of the animal. 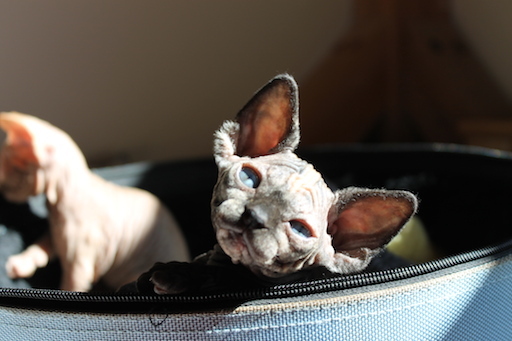 Locating a retired breeder Sphynx is a good way to go to find a less expensive Sphynx that is healthy and well socialized. 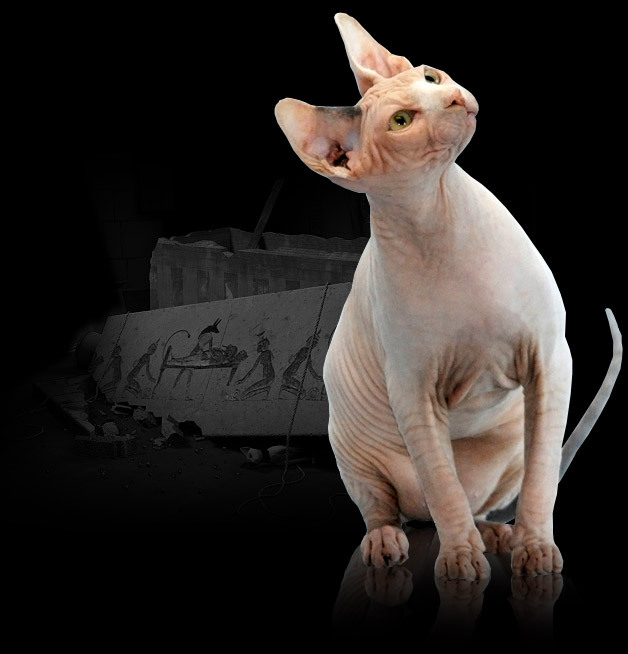 The cost of a retired Sphynx (older than 1 year) usually ranges from $500-$800 and can be dependent on age. A cat that is 4 months to 1 year old have a higher adoption fee than a cat that is 4 years old. 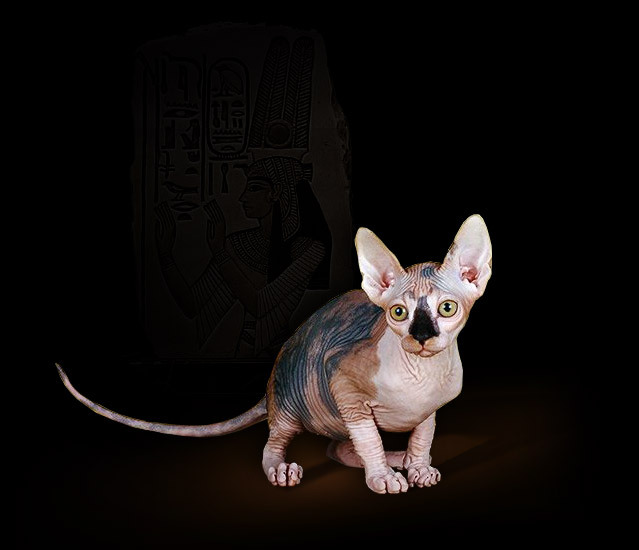 Retired Sphynx cats are great because they are affectionate and playful at any age!